Joining pieces of wood together is a part of woodworking. Different joints and techniques are used to meet different requirements of what is being built. Wood type, strength, and appearance should all be considered for the purpose of the joint. I will show you 7 different joints and with some practice these are all quite easy to make and require very few tools. A few tools are used for marking and measuring and a bandsaw for cutting. Fir and cedar are used for a nice contrast. I will show you a few instructions for some of the joints and the rest use the same technique. There are many fancy tools and machines on the market but I wanted to make nice joints with few and simple tools. 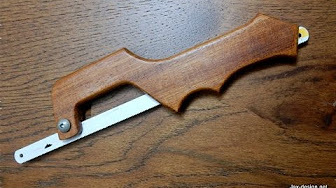 They can be made using a handsaw but I like to cut fast so I will use a bandsaw for all the joints. I also made a jig to cut some angles but there are other ways to do this, such as tilting the bandsaw table. Here are a few tools that you will need. To make these joints here are some important tips. Always keep a sharp pencil, carefully make your marks and cut slow and precise. Make sure you cut on the correct side of the line. Softwoods are easiest to work with. When the pieces are glued and clamped the wood compresses a bit. When the glue is dry you can sand the joints and they will look flawless. I will show you the steps I used for a couple of the joints. This joint looks great and is a signature of craftsmanship. It is very popular in furniture making. To start a bevel gauge is used to mark some angles on the cedar. The angle degree or length was not important, just what looked nice. A piece of fir is positioned and clamped to the cedar. Now with a sharp pencil you can mark the tail that has to be cut. The tail is cut with the bandsaw in four cuts and ready to test. Using a wooden mallet, the pieces are tapped together. It was a perfect fit, I took it apart and put on some glue. Of all the joints I have made here this is the easiest one to make. Again make some marks on one piece similar to the photo. After you cut the block the second one can be placed square on top and mark that piece. Cutting the blocks. It doesn't matter which one you cut first since both blocks should be identical. 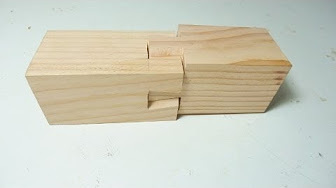 This is a good looking joint and a bit more difficult to make. 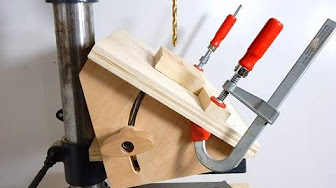 You can always tilt you table but I wanted to try make a jig that swivels quick so I had to modify my small bandsaw sled. I added some pins to the ends of the base to act as a stop for a swivel table. It worked out but this jig can always be refined. It may be a future project. A sliding fulcrum and the table top are added and now I can cut any angle. The cedar is cut first then the fir was clamped and traced out the same way as the dovetail joint. This was the only joint I had to use a chisel and clean out the cedar a bit. For the rest of the joints the same techniques are used. They all turned out clean and tight fitting. I did not know the name for this so I called it an arrow joint. When it comes to making wood joints always start with easy ones and work your way up to the more difficult ones. Start with softwoods and experiment with different colours. Softwoods such as cedar and fir look great together. With some practice you can make your own beautiful joints. Do you have any experience making joints? What kind have you made? Share your feedback in the comment section. Take the rosewood raw material for example, furniture made from different rosewood raw materials have the different prices. Nice piece of wooden work. Keep sharing your great and cool work with us. Obviously, it takes a ton of training to secure the methods and abilities to consummate the undertaking you have as a top priority however do recollect that training goes far in wood working.